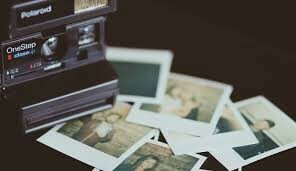 I’m old enough to have seen quite a lot of Polaroid snapshots develop. It’s a bit like watching little kids stirring up mud pies. Kind of gross. And I hate to say it, but most Polaroid snapshots turned out pretty … ugly … in my humble opinion. I wonder — is that “pretty ugly” expression I just typed trying to tell me something? I seem to use the word “pretty …” an awful lot. Just as I use “seem” and “perhaps” and “maybe” and “possibly.” Because it “appears” that I have a hard time committing myself to beliefs or ideas or whatever — ones that I’m afraid someone might make fun of me for, or call me out for, or something like that. And “apparently,” I also put prepositions at the ends of phrases and sentences too often. But anyway, if you’re going to use Polaroid snapshots as a metaphor for writing, I’m not quite sure I want to write, if it means the results are going to look like that! Because, you know, you really can’t edit Polaroids, unlike digital photos which you can at least Photoshop, or even traditional film photos which you can play around with in the darkroom — something which I actually liked doing when I was young! But yes, I do “get” what this metaphor is trying to say. Okay, now that’s good. I like that. About all the props, I mean. I know I’ve got lots of “props” around me — some of which I’d just as well like to toss into a big fire in the middle of a field, and light a match, and watch them go up into a huge, glorious orange mass of flames. Including some of the ones that are comforting, because I suspect that those may be the ones most holding me back, trapping me, whispering “You don’t need to do that; it would be too much work, or too embarrassing, or nobody would care anyway” into my ear. And me sitting there nodding and pulling the quilt tighter around me, tucking in my toes and my nose, covering my head … and shivering. But some of my props are really good, some I really value, some I feel really do define me — only they are the ones I have the hardest time picking out, the ones hiding in the bushes or in the very corner of the picture. Maybe the very last ones in the Polaroid shot to gradually develop and show their true colours? Who am I? What do I need? Maybe I need to take a closer look at those Polaroid snapshots after all, and see what I’ve been missing, what has been slowly developing but I haven’t taken the time and effort to really peer closely and observe the progression, and maybe in a moment of awe and wonder, catch the very second when its truth suddenly pops into view — before other parts of the still-developing photo catch my eye and distract me from what small detail is most important after all. Yes. That. You say it so much more succinctly that I do, Anne. Something for me to learn from and practice, I suppose. Thank you!